Summary: Each of the three Schuyler sisters has her own world-class problems, but in the autumn of 1966, Pepper Schuyler’s problems are in a class of their own. When Pepper fixes up a beautiful and rare vintage Mercedes and sells it at auction, she thinks she’s finally found a way to take care of herself and the baby she carries, the result of an affair with a married, legendary politician. I have become a huge fan of Beatriz Williams' novels especially the ones about the Schuyler sisters. I enjoyed both TINY LITTLE THING (which I just realized I never reviewed!) and THE SECRET LIFE OF VIOLET GRANT (my review); and I was thrilled to see that Ms. Williams' latest novel, ALONG THE INFINITE SEA, was about Pepper, the spunkiest of the Schuyler sisters. The novel was picked as a November Indie Next selection and a November LibraryReads List pick, so I had a feeling that it was going to be a terrific read. ALONG THE INFINITE SEA tells the story of a pregnant and unmarried Pepper Schuyler in the summer of 1966. She has just sold the vintage Mercedes that she renovated to make enough money to take care of her and her child, but she's not saying a peep about the father of her baby although it's apparent that he's a married and successful politician. This influential man wants to make sure that Pepper "does the right thing" so he sends a set of goons to track her down and convince her. Meanwhile, Annabelle Dommerich is the new owner of the vintage car. It is clear that this car holds a very special place in Annabelle's heart and has something to do with her past. She actually escaped Europe in it prior to World War II. Pepper and Annabelle strike up an unlikely friendship, and Annabelle asks Pepper to stay with her. As Annabelle's story about a Jewish lover, a Nazi husband, and a flight from Europe comes to light, her past secrets are gradually revealed. I think ALONG THE INFINITE SEA was my favorite Schuyler sister novel. In all fairness, I listened to the first two books on audio and that's not my preferred method of reading. I really liked Pepper and I thought her story was interesting, but I have to say that Annabelle's story was by far my favorite. I loved the passion, romance, and intrigue of her past! Annabelle was a wonderful character. I am not usually one for love stories, but I actually found her story to be pretty darn amazing. Annabelle fell head over heels in love with a Jewish man in the mid 1930s. They make plans for a future, but he mysteriously disappears. In a rebound move, Annabelle ends up marrying a high-ranking German officer. Needless to say, her life becomes rather interesting as Germany faces many changes and potential war. While Pepper's story was introduced in TINY LITTLE THING, it isn't necessary to have read that novel prior to picking up ALONG THE INFINITE SEA. For those of us who loved Pepper in that book, there are a few references to the Schuyler family that will be appreciated; however, all of the background on Pepper's past is included in this novel. 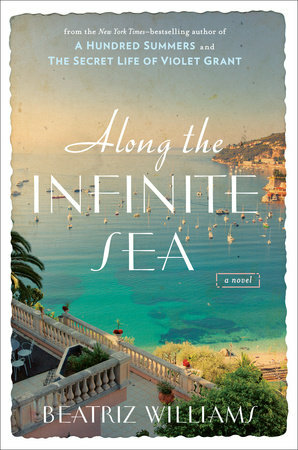 ALONG THE INFINITE SEA would make a wonderful book club selection. There is a little bit of everything in this story from romance, to mystery, to adventure, and more! I wasn't able to find a set of discussion questions yet, but I'm sure they will be available in the near future. Some of the themes you might want to discuss include love, grief, parenting, friendship, loyalty, commitment, and sacrifice. Overall, ALONG THE INFINITE SEA was my favorite of the Schuyler sister novels. It was a page turner that was both entertaining and touching. Highly recommended! I have two copies of ALONG THE INFINITE SEA to share with two very lucky readers. To enter, just fill out the form below before Monday, November 16th at 11:59 p.m. EST. I will randomly select and notify the winners the following day. This contest is open to those of you with U.S. addresses only. Good luck! Even though this is a trilogy it sounds like each of the books stands alone just fine. I think I own two out of the three books. I need to get to work on them! I just finished this one last night and I thought it was the best of the Schuyler sisters books too. Love her books, too. Thanks for the giveaway. What a beautiful cover! I've only read one by this author, A Hundred Summers, but I did like it. BTW, thanks for mentioning the prior story. It's always nice to know if a book works as a stand-alone, or if you will be missing a lot by jumping right in. Just finished this one ... I loved it too.